In order to reap the full benefits of meditation, you need to be at your most comfortable. If your legs or back feel numb or it feels uncomfortable or painful when you sit down, you’re not going to be able to focus your mind on the meditation process properly. 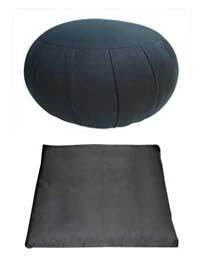 A zafu cushion, which is a traditional type of seating cushion associated with meditation, will provide you with the comfort you need enabling you to get the best out of your meditation practice. How do Zafu Cushions Aid Meditation? The various designs of zafu cushions help to facilitate a proper posture for a prolonged period when you are in a seating position where your back isn’t supported. They help to stabilise your back and to keep your spine aligned. There are two predominant shapes to a zafu cushion. One type is round and is stuffed with either buckwheat hulls or, for a softer and lighter cushion, natural kapok is used. These materials are the most commonly used for filling as not only are they deemed to be comfortable for prolonged periods sitting down in a meditation position, but they’re also highly resilient materials which mean that they’ll maintain their flexibility over a much longer period. The other main shape is the crescent (or kidney) shaped zafu. They are made of the same materials but a lot of people prefer them if they are meditating in the cross-legged seating posture for a long time. These are sometimes referred to as ‘smile cushions’ because of their crescent shape. The most traditional seating posture on a zafu is the cross-legged lotus position. Here you’d generally sit low and forward on the zafu whereas in the half-lotus position, you’d tend to sit a little bit higher on it. You also tilt your pelvis slightly forward which helps to keep your spine in alignment. The Burmese position is similar to the lotus but in this instance, you have one leg slightly more forward than the other and not placed one across the other. Another way of using the zafu cushion is the seiza position. Here, you kneel and place the zafu behind you on its side between your heels and then you can sit back, resting your back and letting the zafu bear your body weight. Zafu cushions do not necessarily need to be restricted to meditation. They are very useful for providing additional temporary seating when you have more guests than chairs can accommodate. In a similar fashion to a beanbag, they are portable so you can bring them out when it’s necessary and they’re easily transported too. They can also be used as a makeshift table whilst you’re sat on the floor. For example, you could be sat on the floor and work on a laptop which is placed on top of the zafu. Zafus are also sometimes used in conjunction with a zabuton mat which is placed under the zafu to provide a soft cushioned surface to rest your legs on. If they are filled with buckwheat hulls, then these can be replaced after a while if the zafu starts to become more compressed. A zafu cushion is not that expensive to buy at around £30 for a basic cushion, although there are plenty of instructions online for making your own.